Annabel Hughes Aston is a writer who cooks, gardens and forages. 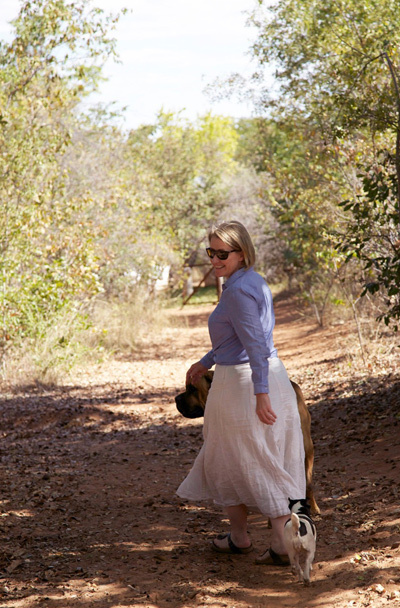 She lives with her husband, Chris, on a farm in the Zambezi Valley, upstream from Victoria Falls in Livingstone, Zambia. She is the creator of "bush gourmet" cuisine, developed by fusing wild edibles and indigenous Zambian ingredients with locally-grown seasonal garden produce. Annabel trained as a chef at the Ewert Place School of Cookery in Oxford, England, but only cooked occasionally after choosing a career in journalism instead. She started gardening, and cooking what she grew, following a relocation to Virginia in the United States in 2003. In 2011 she completed the Virginia Master Naturalist program, which introduced her to the joys of foraging. Annabel’s "bush gourmet" cuisine—the corollary of her desire to live as close to ‘source’ as possible alongside her passion for gardening, foraging and feeding people—has won multiple awards after she introduced it at The Elephant Café in Livingstone, Zambia. Annabel moved back to Africa, where she was born and grew up, at the end of 2012. She has published in magazines and newspapers in North America, Europe and southern Africa, and writes the food and lifestyle blog, SavannaBel. "Our assets expand with the nourishment of our awareness. When we collaborate. When we respect. When we share. When we heal." My last few years living in the United States, especially after the seismic financial downturn in 2008, were fraught with survival anxiety. In my search for a way to continue paying my bills in an economy where even my bank went under, a different kind of creativity emerged from within me, that, over time, led to a fundamental shift in my core beliefs. To me, no way of life exemplifies this more than that of southern Africa’s oldest inhabitants, the San Bushmen, who I worked alongside briefly when I left America in 2012 and found a job in a safari camp in the middle of the Kalahari Desert in Botswana. Even though the San’s hunter/gathering existence has been upended and overtaken by the modern world, the people I walked with, and learned from, showed me sufficiency through taking from their meager natural resources only what their bodies needed in that present moment. Their way of life, to me, was a classic example of interdependence, learned from evolving alongside plants and wildlife in the dystopia of an unforgiving desert. While the San people foraged alone, what they found was owned and eaten collectively. They preserved (burying certain ingredients like wild oranges in the cool of deep sand), they roasted, and they dried wild food to make it more palatable, or easier to eat and digest.